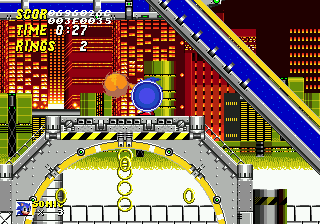 This corner, which is meant to make Sonic go to a platform above, does not recognise Sonic's movements, allowing Sonic to simply go through it without any interaction. The corners of the loop-de-loop have been cut off in the Beta version, but in the final the loop is in a box shape. 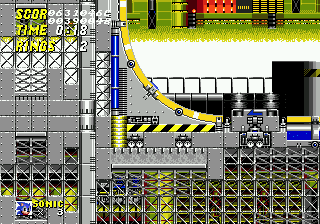 These small platforms will take Sonic from one side of the 'mega muck' to the other. 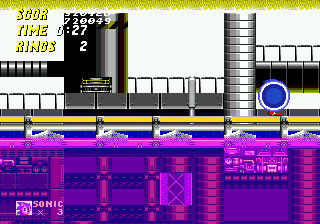 In the Beta, the platform is a little shorter than the final one. 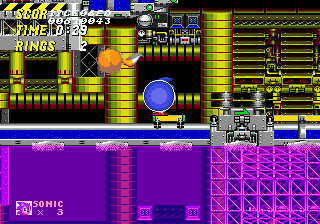 The end of Act 2 leaves you with a Bonus Panel instead of a fight with Dr. Eggman.